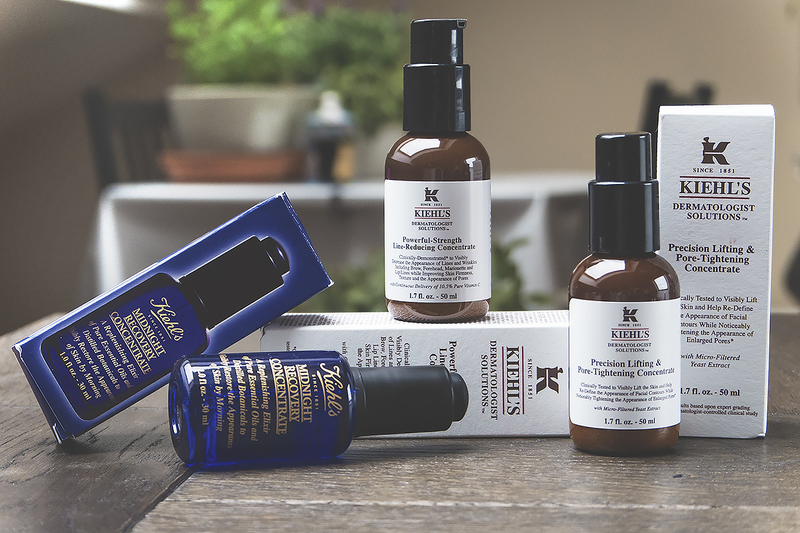 Kiehl’s concentrates are powerful serums that target specific skin concerns. It’s always difficult writing these articles as I can’t always tell what you, the reader, is aware of; some of you are experts and some of you are skin care beginners. So if you’re a seasoned expert; brush over this next section. What is a serum and why do I need one? So I’m guessing you’re already using a moisturiser? If not, stop reading immediately, click here, read the intro and find yourself one in the huge archive of moisturisers I’ve reviewed (or tweet me). But if you are using a moisturiser, well done! But a moisturiser only, well, moisturises; using a ratio of and/or oil and water to rehydrate the surface skin cells. A treatment/serum/concentrate is usually a lightweight skin care product designed to target the lower levels of your skin as a moisturiser only works on the exposed layers of the epidermis, the outermost layer of your skin. So what is your skin concern? Acne? Enlarged Pores? Redness? Sensitivity? Wrinkles? and on, and on, and on… Whatever it is or they are then you need a treatment/serum/concentrate to target them, as a moisturiser alone, however much it promises, is not going to give them the attention they deserve. Unless otherwise stated, a treatment/serum/concentrate goes underneath the moisturiser. Some regimes work by adding the treatment over the moisturiser as by specially hydrating the top layers of skin turning it into a big sponge, allowing the serum to be pulled further down into the skin; but, stick to the former unless you’re advised otherwise. 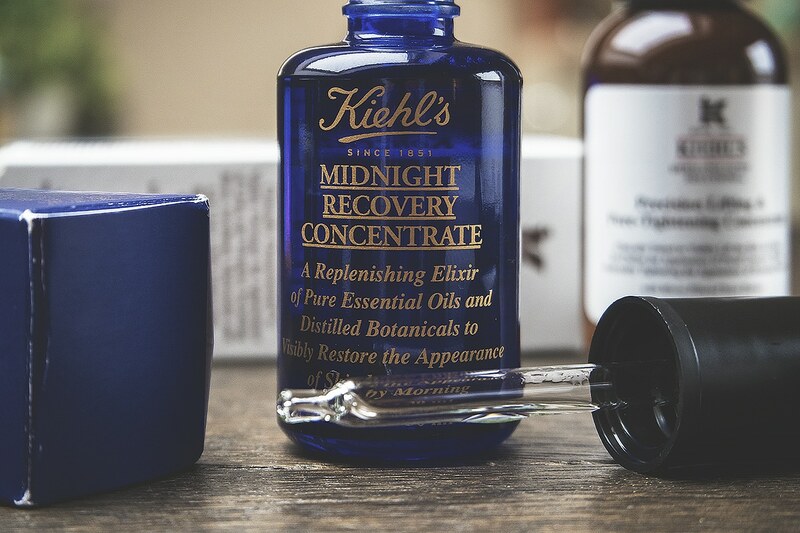 Kiehl’s Midnight Recovery Concentrate is the best all round skin serum you’re probably going to find, for all skin types and complimentary to all skin concerns. An oil (don’t panic) serum formulated with 99.8% natural ingredients including Squalane, Evening Primrose Oil, Omega-6 Fatty Acids and Essential Oils including Lavender. The combination of essential oils and accompanying ingredients calm, soften, rehydrated, plump and brighten the skin by the morning by complimenting your skin’s natural, overnight recovery processes. Good god yes. Firstly I freaked out with it being an oil and seriously put off using it for ages; it just sat there. After getting up the courage, I placed 3/4 drops onto my forefingers, pressed together and slowly but firmly massaged it into my freshly cleansed face. It sinks in almost immediately and didn’t leave me greasy and shiny, although I guess shine doesn’t really matter when you’re asleep anyway. I did find I needed to place my moisturiser over the top just to seal in the hydration (I’m using the Bobbi Brown Gel Cream at the moment) but still didn’t feel overwhelmed with moisture. The first morning after, my skin felt incredible and the deepest lines on my forehead, from frowning, looked noticeably reduced. After using the Midnight Recovery Concentrate for a week or so, my skin looks amazing, just fresher and easier to maintain. Oh and Midnight Recovery Concentrate smells insane; so good! A serum in its purest form and texture formulated with micro-filtered yeast extract, rosemary leaf oil, salicylic acid (exfoliates), soya protein, pelargonium oil and dimethicone. It essentially pulls and tightens the skin with the firming properties of yeast extract, exfoliating with salicylic acid and soothing/hydrating with a range of essential oils and extracts. Ageing, or photo-ageing as it’s otherwise known, is when the collagen and elastin in the dermis (central layers of the skin) become weakened by UVA radiation (one of the two types of radiation from the sun). We’re exposed to UVA all the time, not just in summer; as a rule of thumb: if you’re seeing outside without a light, you’re being exposed to UVA (and UVB). There is very little you can do to reactivate and restore elastin and collagen function without cosmetic procedures; unfortunately standard skin care treatments just can’t function that far down in the skin although some products are able to send regenerating ‘signals’ which have been proven effective, but that’s another story for another time. What does tend to happen however is dehydrated, dead surface skin cells collect in the lines and wrinkles making them seem deeper than they are. This is because light bounces off them unevenly resulting in diffused light, making them seem duller and darker. When light hits and reflects evenly, they look shallower and brighter. 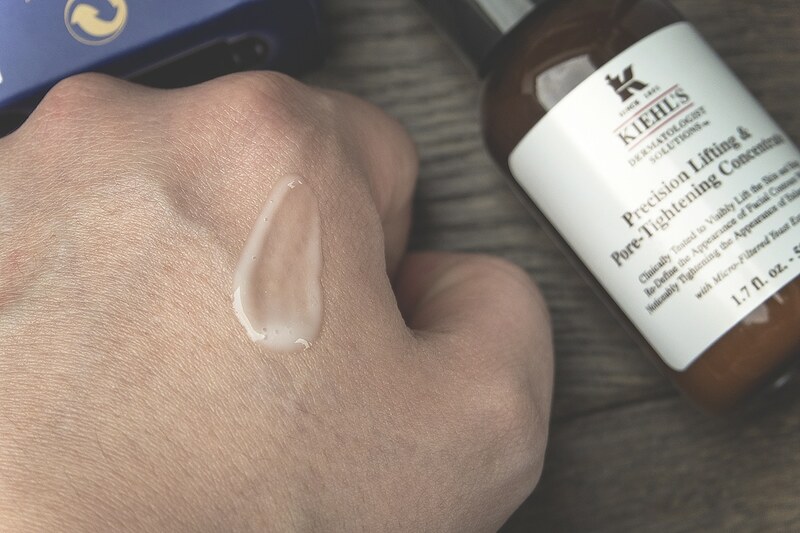 Kiehl’s Precision Lifting & Pore-Tightening Concentrate therefore exfoliates away these dead skin cells; tightens the surface of the skin with yeast extract and then plumps/soothes the surface of the skin with it’s oil/moisture complex to reduce the overall appearance of wrinkles. The wear and tear of pores is similar to that resulting in lines and wrinkles. If your skin is oily, you’ll often notice you have enlarged pores. If your skin is dry, you may find you can’t even see your pores! If you take an elastic band and keep stretching it and relaxing it over and over and over again, what happens? It becomes weaker, enlarged and sometimes snaps. This is pretty much what happens to the pore wall. After pumping out so much oil time and time again, the walls of the pore become weak, lined with dead skin cells and enlarged. They can even sometimes block, trapping in p.Acne bacteria (the spot causing bacterium that lives on our face) and producing large pustules. 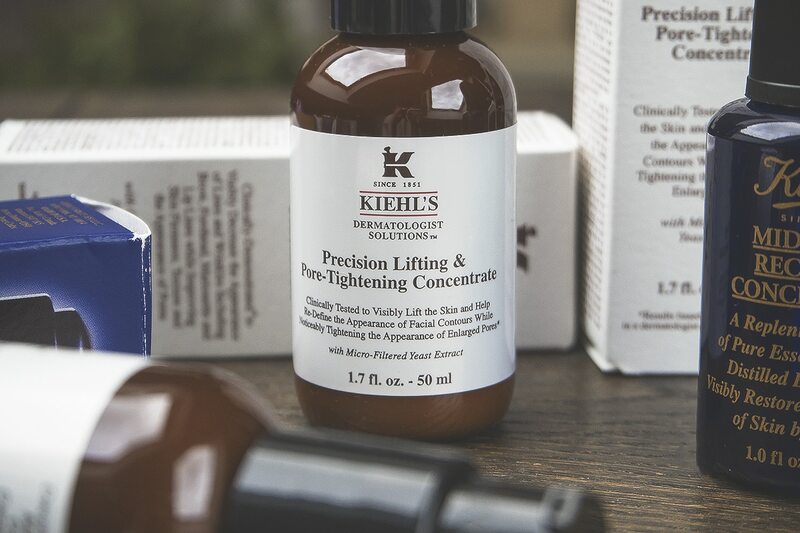 Kiehl’s Precision Lifting & Pore-Tightening Concentrate therefore exfoliates the wall of the pore, tightening it up over time. The micro-yeast extract will also help to tighten the skin’s surface resulting in smaller visible pores. I would still look at a moisturiser that’s rich in water, not oil, to help regulate healthy oil production as it’s usually both internal and surface dehydration that leads to an overproduction of oil (as the skin tries to rehydrate itself). I didn’t notice huge differences in my few visible wrinkles (forehead) but I did notice an effect on my pores; particularly around my nose where they tend to be the largest. Overall my skin did feel firmer but as I’m in my twenties, I don’t have much loss of elasticity so far, but it was the tightening of pores that I really loved; particularly without leaving my skin feeling dehydrated and dry which many ‘tightening‘ products often do. Very simply, a lightweight serum featuring a stabilised concentrate of 10.5% pure Vitamin C.
Most natural damage on the skin is caused by oxidative damage. This can be prevented by antioxidants. Vitamin C, when harnessed correctly, is one of the most powerful antioxidants around. Atoms are the building blocks of everything. They’re surrounded by electrons. Sometimes, an atom can become unstable by loosing one of its electrons. When this happens, the atom whooshes around looking for a spare electron that it can cling onto, re-stabilising the atom. During it’s journey however, all sorts of damage can be caused in the process, breaking down DNA strands and cells resulting in reduced cell growth or even worse, malfunctioning cell growth / cancer. What an antioxidant does is turn up to the party with spare drinks for everyone. It has an abundance of spare electrons that it doesn’t need in order to stay stable. So when the skin is flooded with antioxidants, the unstable atoms can take from this abundance of electrons and stabilise themselves without going haywire and destroying everything in its path. Therefore eating foods and using products that effectively deliver antioxidants to the body will keep it functioning healthier for longer, reducing risks of a whole number of problems but in this case, slowing down the degradation of collagen and elastin, keeping skin firmer and plumber for longer. It’s hard to say as you can’t really see antioxidants getting to work. It feels amazing on the skin. One of the secondary effects of Vitamin C is its extraordinary brightening properties, breaking down surface pigmentation and leaving your skin looking incredible bright. I have definitely noticed more uniformity in my complexion – it glows! As far as an antioxidant goes, you can never really know if it’s working or not. 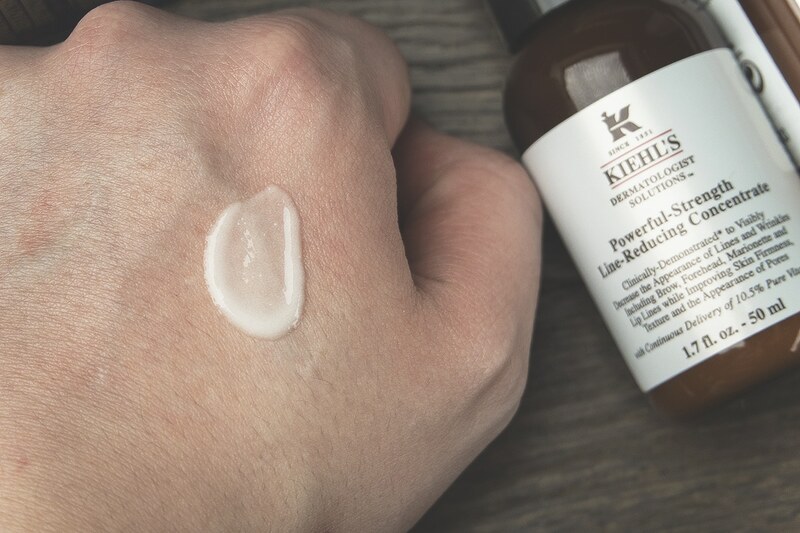 But what you can rely on is the clinical grade testing the product undertook by Kiehl’s over 8 weeks, before it went to market. 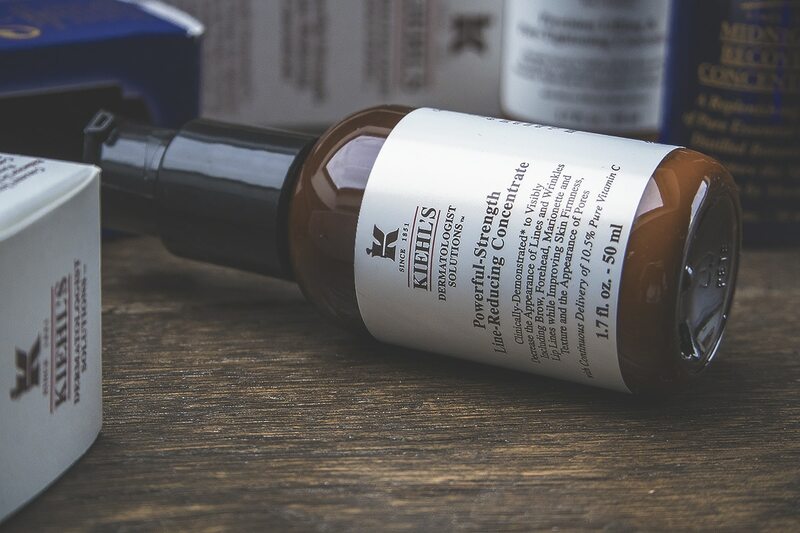 If you’re wanting to stave off ageing and brighten your complexion then the Kiehls Powerful Strength Line Reducing Concentrate is definitely for you. It’s a gorgeous texture that sinks in well under your moisturiser and disappears into my skin without a trace. This article first appeared on MANFACE written by Thom Watson. It was published on Wednesday 15th April 2015 and was last updated on Monday 3rd April 2017 at 1:30pm. It's categorised under Anti-Ageing, Enlarged / Blocked Pores, Kiehls, Oily Skin, Serums & Treatments where you'll find more related content. 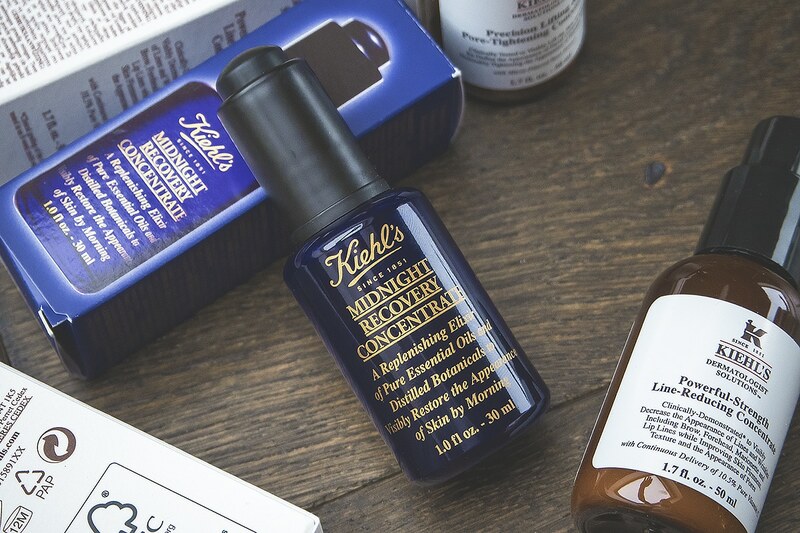 This post is a god-send, as I’ve been wanting to purchase some Kiehls products, but wasn’t sure where to begin. Midnight Recovery Concentrate is one of my faves, it’s fantastic. Quite tempted to give number 2 a go though, as pores are one of my face-based downfalls, blah.